I would like to read Junkland, an exciting Medieval fantasy adventure, by Patrick Johns, which is book one in the Hoarding Trilogy. It features a young boy named Jahrys Grent, from Palor, who has only one dream: to become a knight. While he works in his father’s shop, he daydreams of fearless knights from tales long ago. He longs to save a princess from treacherous outlaws, overthrow cruel kings, and explore the lands beyond the Farrest Sea and the Western Mountains. Shin Godzilla starts when Japan Coast Guards investigate an abandoned yacht in Tokyo Bay, however their boat is destroyed and the Tokyo Bay Aqua-Line is flooded by something extremely large. Deputy Chief Cabinet Secretary Rando Yaguchi sees a video of the incident, and both he and the Prime Minister try to assure the public not to worry and that they are safe. However It manages to get to the city, leaving a path of destruction and numerous civilian casualties before returning to sea. The government officials focus on military strategy and civilian safety, while Yaguchi is put in charge of a research task force. After examining high radiation levels wherever the creature has been he theorizes that it may be energized by nuclear fission. The U.S. sends a special envoy, Kayoko Anne Patterson, who reveals that a disgraced, vehemently anti-nuclear zoology professor, Goro Maki, had been studying mutations caused by radioactive contamination and theorized the appearance of the creature, but the U.S. covered it up. The abandoned yacht belonged to Maki and he left his research notes there before disappearing. The creature, named Godzilla after Maki’s research, reappears, now twice its original size, near Kamakura en route for Tokyo causing more devastation, so The Japan Self-Defense Forces mobilize, however this has little or no effect. So The U.S. intervenes to defend their embassy, prompting the evacuation of civilians and government officials and U.S. B-2 bombers bombard Godzilla. However this has little effect either when Godzilla responds with highly destructive atomic rays. Top government officials are also caught in the crossfire when their helicopter is destroyed during The battle which leaves radiation fallout and destroys a huge part of Tokyo. After depleting it’s nuclear energy Godzilla enters a torpid state and Yaguchi’s team seize the opportunity to research Godzilla’s fins and blood and work out a way to defeat Godzilla. They also discover that Godzilla is an ever-evolving creature, able to reproduce asexually. Ada called herself an Analyst (& Metaphysician), and the combination was put to use in the Notes. She understood the plans for the device as well as Babbage but was better at articulating its promise. She rightly saw it as what we would call a general-purpose computer. It was suited for “developing and tabulating any function whatever. . . the engine is the material expression of any indefinite function of any degree of generality and complexity.” Her Notes anticipate future developments, including computer-generated music. Ada Lovelace sadly passed away on November 27, 1852, in Marylebone at the age of 37, from Cancer and was buried beside the father she never knew. Her contributions to science were resurrected only recently, but many new biographies* attest to the fascination of Babbage’s “Enchantress of Numbers.” And her immense contribution to Maths, Metaphysics, science and modern computers has finally been recognised. The Classic American novel The Adventures of Huckleberry Finn by Mark Twain was first published 10th December 1884 in the United Kingdom. It is told in the first person by Huckleberry “Huck” Finn, a friend of Tom Sawyer and narrator of two other Twain novels (Tom Sawyer Abroad and Tom Sawyer, Detective) and is a sequel to The Adventures of Tom Sawyer. It features colorful description of people and places along the Mississippi River and satirizes the Southern antebellum society. 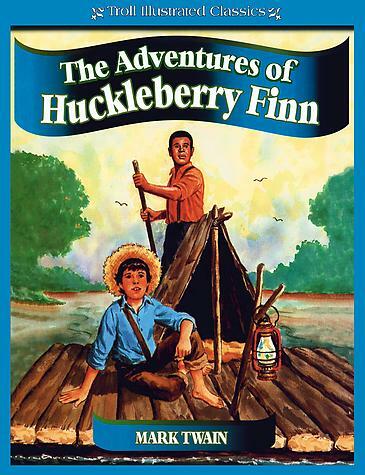 Adventures of Huckleberry Finn is an often scathing look at entrenched attitudes, particularly racism and has been studied by serious literary critics since its publication. It was criticized upon release because of its coarse language and became even more controversial in the 20th century because of its perceived use of racial stereotypes, despite strong arguments that the protagonist & tenor of the book, is anti-racist & explores notions of race and identity & highlights the hypocrisy required to condone slavery within an ostensibly moral system. While some scholars suggest that Jim was a good-hearted, moral character, others have criticized the novel as racist. Huck struggles not only with the challenges of his strenuous journey, but also with the 19th century social climate and the role it forces on him regarding Jim. Throughout the story, Huck is in moral conflict with the received values of the society in which he lives, and while he is unable to consciously refute those values even in his thoughts, he makes a moral choice based on his own valuation of Jim’s friendship and human worth, a decision in direct opposition to the things he has been taught. Mark Twain in his lecture notes proposes that “a sound heart is a surer guide than an ill-trained conscience”, and goes on to describe the novel as “…a book of mine where a sound heart and a deformed conscience come into collision and conscience suffers defeat”.To highlight the hypocrisy required to condone slavery within an ostensibly moral system, Twain has Huck’s father enslave him, isolate him, and beat him. When Huck escapes – which anyone would agree was the right thing to do – he then immediately encounters Jim “illegally” doing the same thing. Some scholars discuss Huck’s own character, and the novel as a whole, in context of its relation to African-American culture as a whole. John Alberti quotes Shelley Fisher Fishkin who writes in her 1990’s book Was Huck Black? : Mark Twain and African-American Voices, “by limiting their field of inquiry to the periphery,” white scholars “have missed the ways in which African-American voices shaped Twain’s creative imagination at its core.” It is suggested that the character of Huckleberry Finn illustrates the correlation, and even interrelatedness, between white and black culture in the United States. Huck and Jim take residence In a cavern on a hill on Jackson’s Island. When they can, they scrounge around the river looking for food, wood, and other items. One night, they find a raft they will eventually use to travel down the Mississippi. Later, they find an entire house floating down the river and enter it to grab what they can and also find a dead man, shot in the back while apparently trying to ransack the house. Huck find out the latest news in the area, and is worried by what he learns, so he returns quickly to the island where he tells Jim of the impending danger. The two immediately load up the raft and leave the islands. Huck and Jim become separated. Huck is given shelter by the Grangerfords, a prosperous local family & becomes friends with Buck Grangerford, a boy about his age, and gets involved in the Grangerfords blood feud against another family, the Shepherdsons which comes to a head when Buck’s sister, Sophia Grangerford, elopes with Harney Shepherdson. In the resulting conflict, all the Grangerford males from this branch of the family are shot and killed, and Huck narrowly avoids being killed himself.